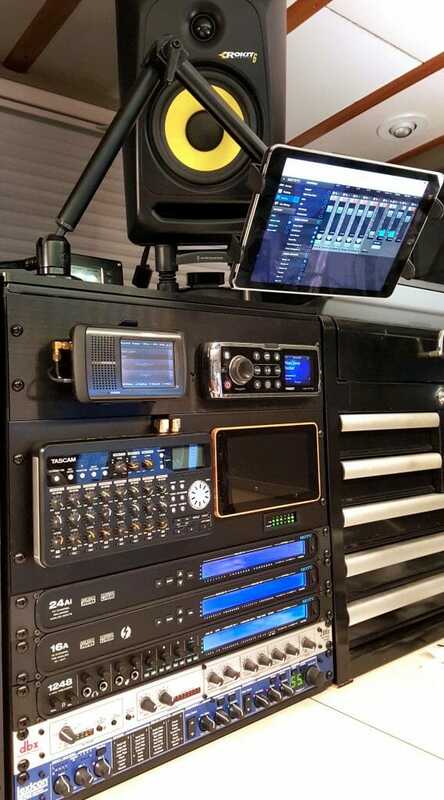 Most of my posts about the starship Datawake focus on the geeky components… console systems, the holodeck, exotic digital radio, studio-grade audio processing, and so on. But this boat is home as well as lab, and many of my projects are unglamorous, non-blinking tools for simply improving the quality of life aboard. This post covers a few of those. For the past year, I’ve been crawling around on the floor when it gets dirty enough to bother me, dragging the shop vac and manually wielding a brush. This is painful and inefficient, but the big upright left over from my last attempt at living in a house would be too bulky to stow, and I have yet to see compromise mini models that work well enough. 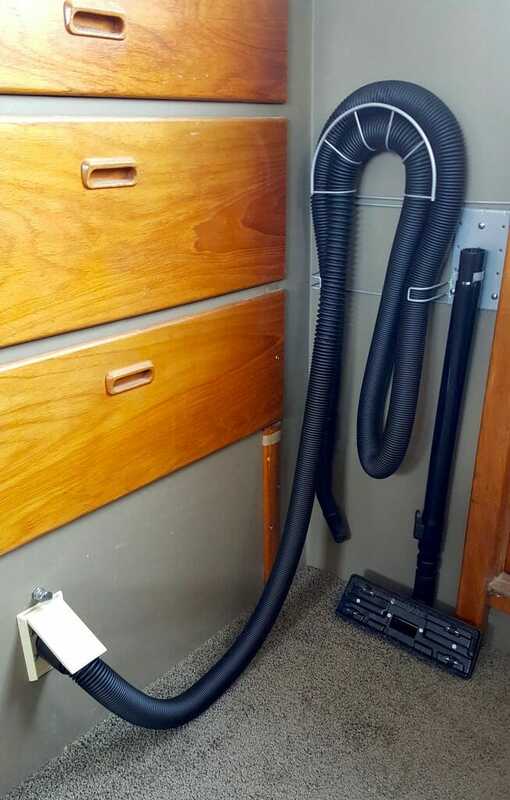 There are some superb handhelds (like the Dyson that my friend Steve likes on his sailboat), but I really want something suitable for a 50-foot boat with large carpeted areas. 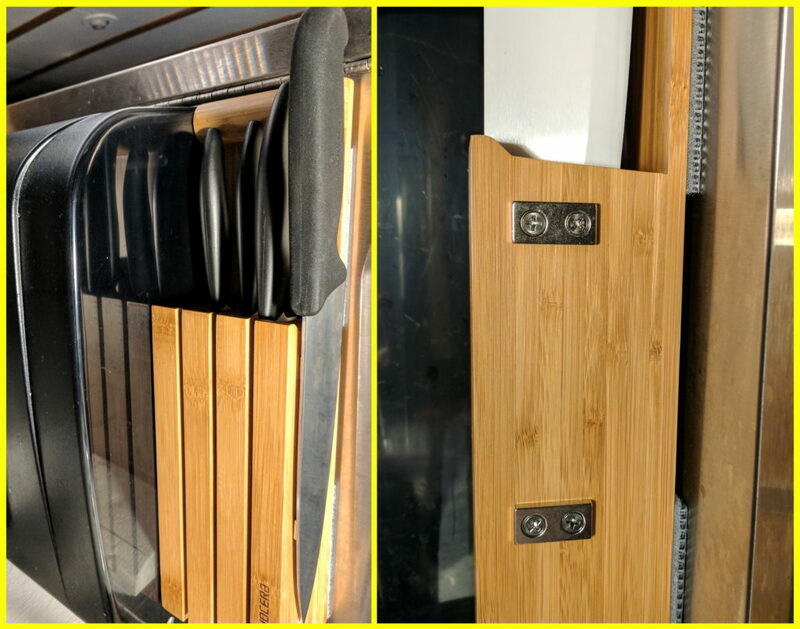 The mounting location is reasonably central in the boat; the machine is on a shelf in the laundry room, convenient for bag cleaning/replacement, and the outlet is in the pilothouse near the starboard door. I added that chrome pull switch to give me the option of leaving the hose plugged in (one less thing to stow! 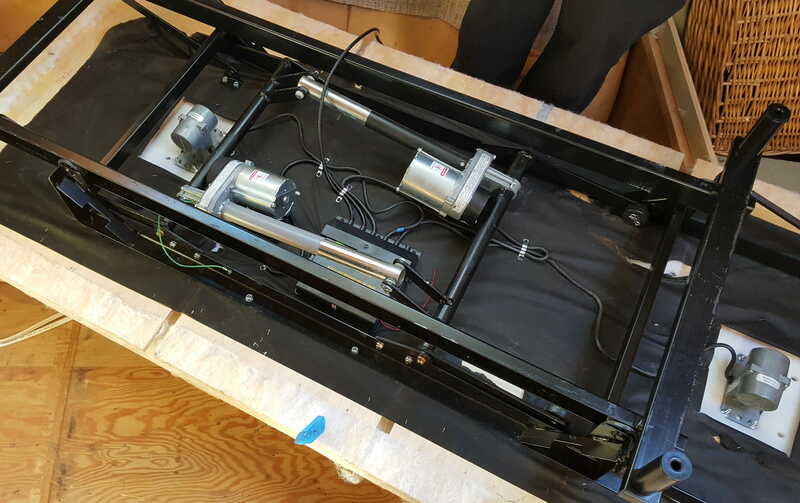 ), since the default motor control is automatic when the hinged cover plate is opened. At the main workstation as an audio mixer panel, random event alerter, and network activity display. This is up in the air to the right of the audio console. Over the piano as a sheet-music display, sometimes with foot-pedal (Airturn) page-turning control. On the wall of the galley as a recipe reference without getting all goopy from being on the counter. 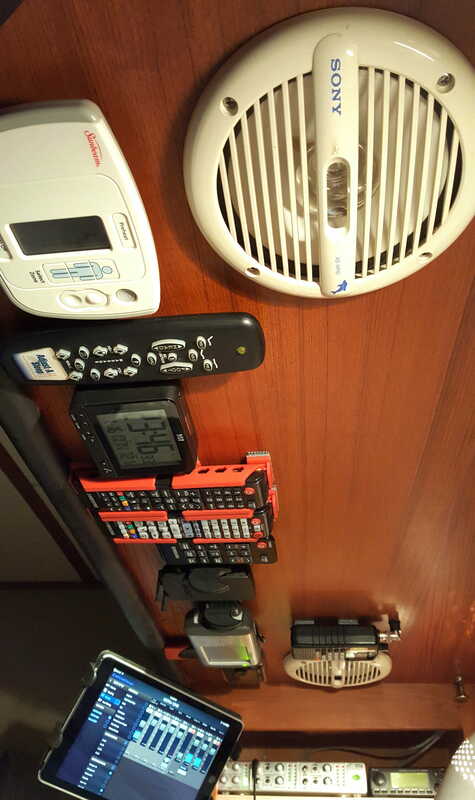 Above the bed as a general tool for Facebook, messaging, reading, YouTube, remote control of Fusion and MOTU audio systems, etc. I briefly considered four older iPads, but even if cheap, that’s still a pain… more machines to keep up to date, more confusion, more stuff. The solution is much simpler, and was obvious once I thought about it. 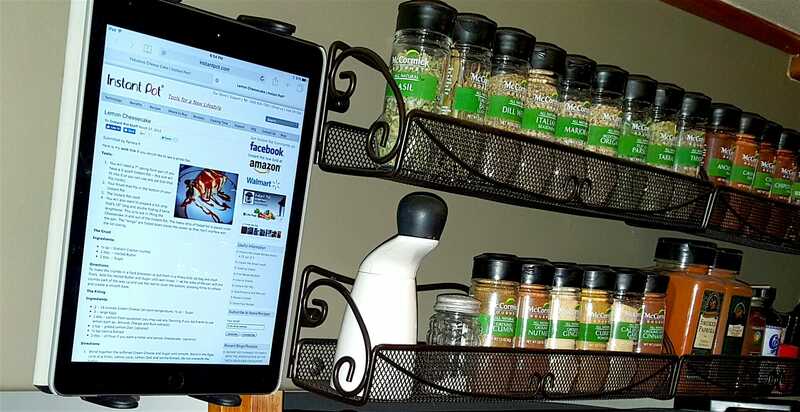 First, I installed an Arkon heavy-duty tablet mount with 22″ arm length, located at the front left corner of Console zone Epsilon. The first mode above is handled when the arm is swung to the right; piano mode happens when I swing it to the left. So far, so good… two down! 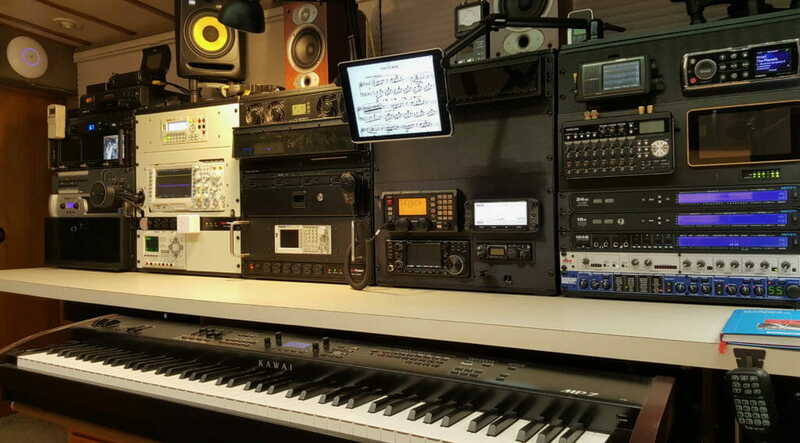 The photo above shows it in piano mode, although sometimes I prefer the simple music stand since I have binders, educational material other than YouTube, and printed scores. That photo above showing the iPad along with the rest of the bed console might have raised some eyebrows, so I’ll comment on it a bit more. This region is a work in progress, with some biometric and myoelectric-feedback projects on the horizon. But the basics are pure lifestyle-enhancement, starting with the bed itself. 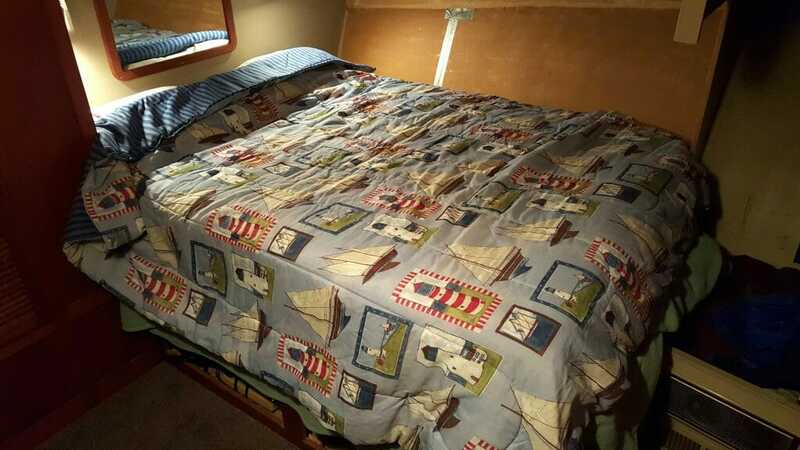 The one that came with the boat was actually fine (though I sure wish it had an island berth… making a bed against a wall is a pain, and I’m working on a bedding-clamp fixture to simplify the process). 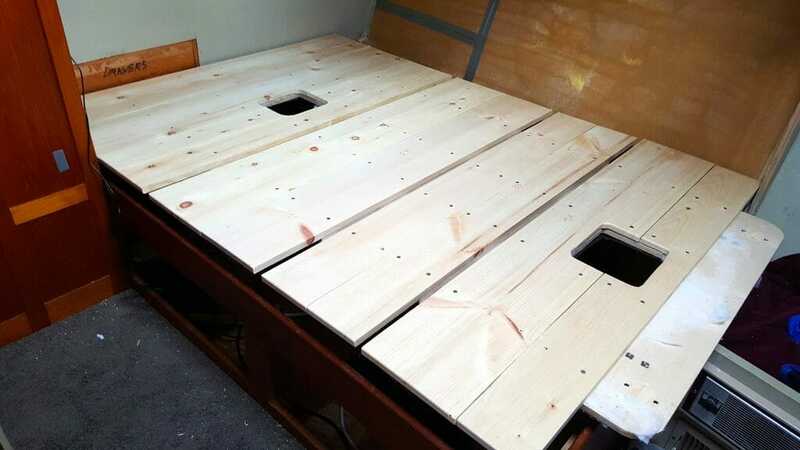 But the first step was to extract the original structure with Sawzall and Fein implements of destruction, then modify and install a Leggett & Platt S-Cape adjustable bed platform. I then built this up with a GhostBed (jury’s still out), memory foam topper (necessary for my back), and heated pad (wonderful)… thus guaranteeing that normal fitted sheets won’t fit. I have some fabrics work to do to perfect this, but it’s working well; the adjustability, vibration, and heat are absolute lifesavers for me, though it is way too short. As to the geeky bits, well… there are quite a lot of electronic devices in this region. Since I finally have a decent net connection, I decided it was time to install a boat theatre, sized to fit the remains of that wall I modified to make room for the new bed. 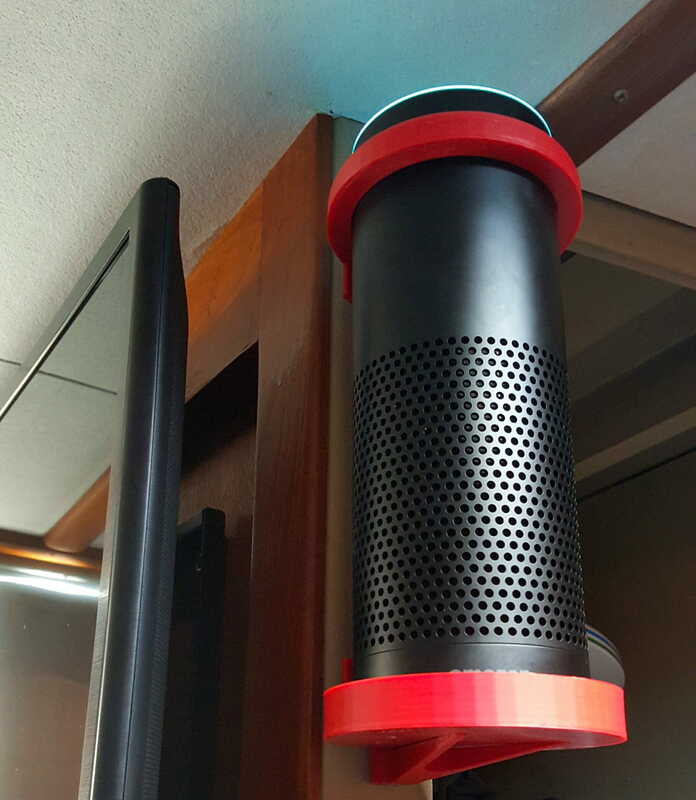 Having this next to the Amazon Echo is just fine except for one minor detail. I changed the wake word from Alexa to Computer, and it is a pain when watching reruns of Star Trek. 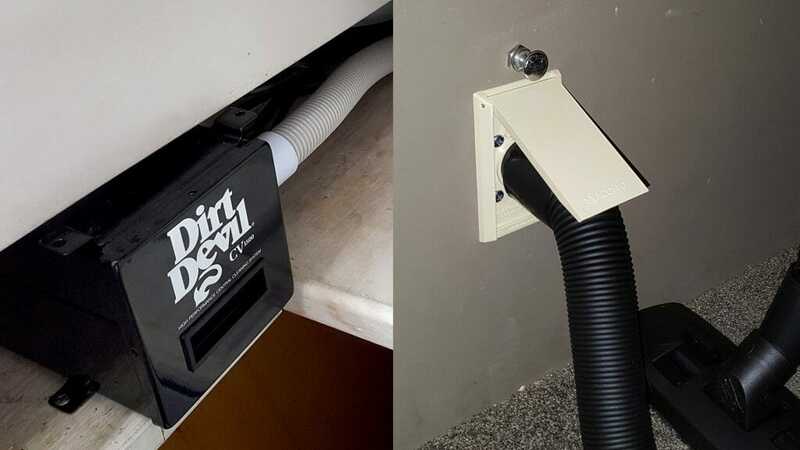 Just below the TV with its simple wall mount is an 80-watt soundbar, and this not only makes the audio vastly better than the tinny internal speakers, but connects via a local mini-mixer to a feed from the MOTU audio routing system back in the main audio console in the lab. The beauty of this is that I can lie in bed, tap an icon on the iPad, select an audio source or mix, route it to the little mixer in the cabin, and then listen via headphones or the soundbar. This is essentially just a node on that system, and a bit more flexibility is provided by Bluetooth if I want to locally pipe phone or iPad audio to the good speakers on the wall. ASIDE: Just a teaser on what’s next in the Lifestyle Geekery department: in addition to a suite of biometric tools, I’m starting to play with a very simple biofeedback system that is optimized for myo-level signals. 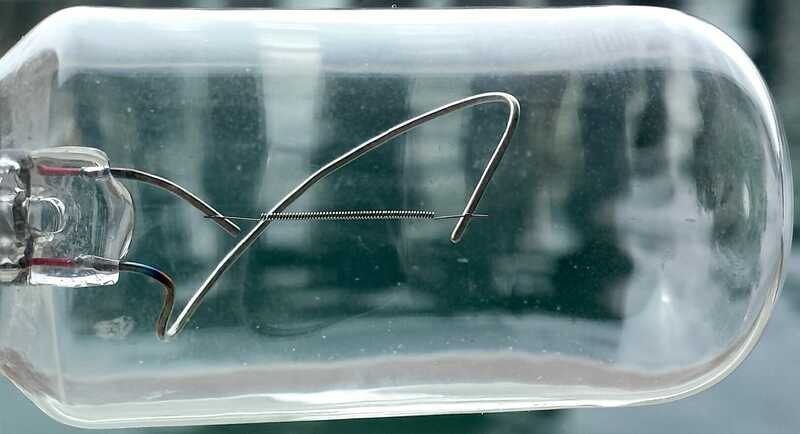 I have muscles that never relax, and want to train myself to control them… tricky when the target is part of the monosynaptic muscle spindle servo loop that involves intrafusal sensors and the Gamma efferents that maintain tone. If that loop is habitually set to an extreme level, as mine seem to be (self-splinting, or whatever), then the only way to fight it is to find the “knob to twiddle,” long-buried behind a wall of pain, and learn to deliberately relax the damn thing. So I’m using little instrumentation amps and an Arduino to try to identify these and control them… although frankly, while I think large muscles like piriformis will be easy, there are a lot of layers back there and isolating groups might be harder than I imagine. Worth a try, though, and a good tool to integrate into the sleep lab! This boat was built in 1974, and despite her current gizmologically intensive theme, she still carries a lot of ancient technology… like a huge 32-volt battery bank that powers incandescent lighting of that obsolete standard (though they are still used on railroads). Fortunately, these have the standard Edison base, so the retrofit to smart LED bulbs did not involve replacing fixtures. This photo shows one of the old bulbs, glowing inside one of four different kinds of fixtures. 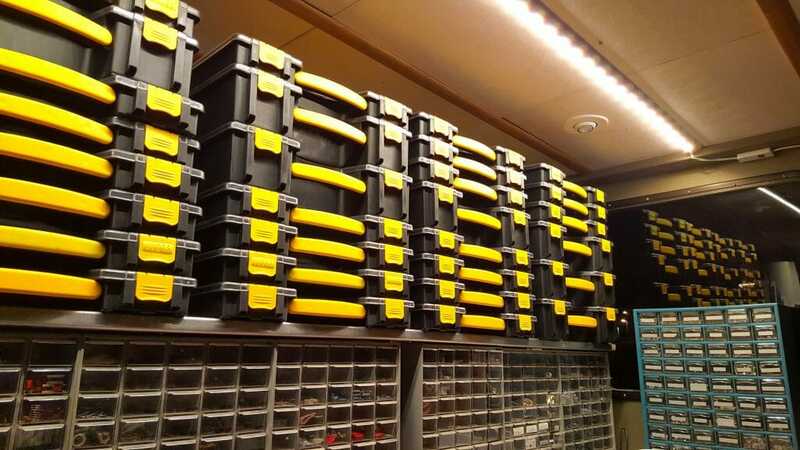 In addition, the ceiling lights in the lab region are all flush-mount halogens, with a tricky switching system to allow them to be bright or dim, and in different groupings. All very messy! In the lab, I just left the old fixtures (with vague plans to replace them someday), and added two Philips Hue Lightstrips along the central beam, extended to total about 10 feet each. An additional extension (via RJ-45 adapters) illuminates the counter over the espresso machine, and another strip is over the media desk. 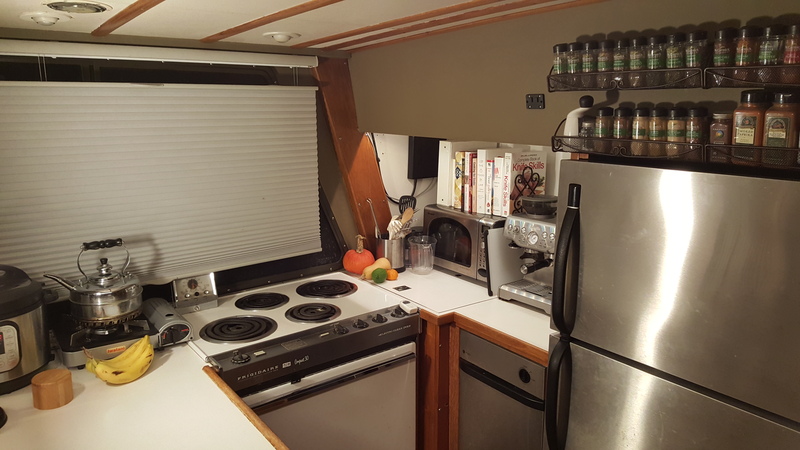 Fixtures over the console and on the galley counter have smart A19 white bulbs, which are the same as the nine distributed around the living areas of the boat. 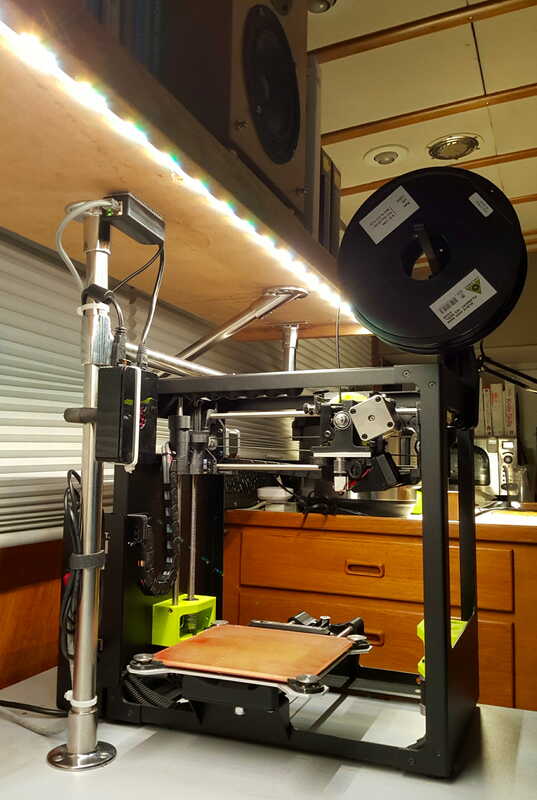 And the pilothouse likewise has the Hue strips, along with another white bulb on a work light at the electronics assembly bench. It is incredibly useful. I have become accustomed to fine-tuning the lighting environment through spoken commands, and with the phone apps I can adjust the color of the space to warm it in the evening (reducing the blues that suppress melatonin and adversely impact sleep). This system is like f.lux for the living space. I also have this stitched into the ship security system, which is another whole mesh network connecting about a dozen sensors to a bridge on the LAN. When it notices me leaving (with keyring transmitter and cell phone moving out of range), it starts monitoring perimeter and motion sensors… turning on the lights and capturing video streams to a cloud server if anything seems suspicious. And it’s fun to stand up in the parking lot and remotely control the boat’s color, or even put it into a lively disco mode! When I started the lighting retrofit, I didn’t yet know much about Philips Hue… only that it was the expensive one. My first attempt to put LED strips over the media desk was unsuccessful; it was bright enough, but there was an annoying blue artifact down the middle from the alternating-strip overlap of the pump-light fringe spilling around the YAG:Ce phosphor conversion targets. 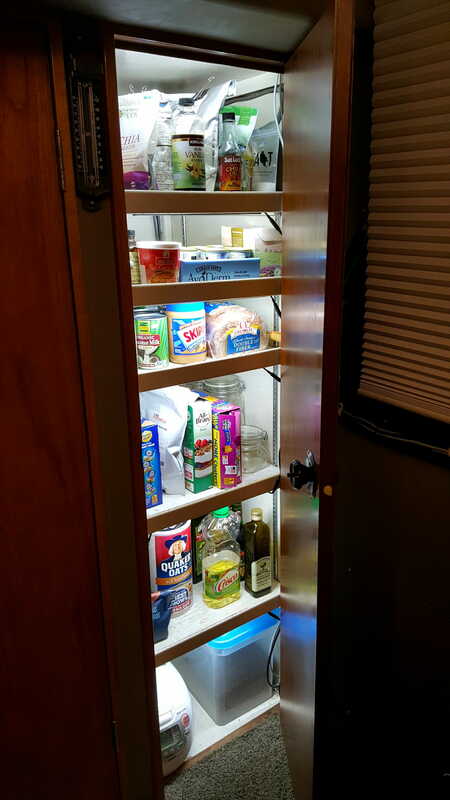 I needed better quantum yield across the full angular range for a workspace, but they turned out to be perfect for the pantry: I dragged a 12-volt line up from the shop, added a microswitch to sense door position, and simply stuck the segments under the lip of each shelf… now I can actually see what’s in the back without having to go find a flashlight! So I recommend these after all, just not for desk lighting applications where color is critical. 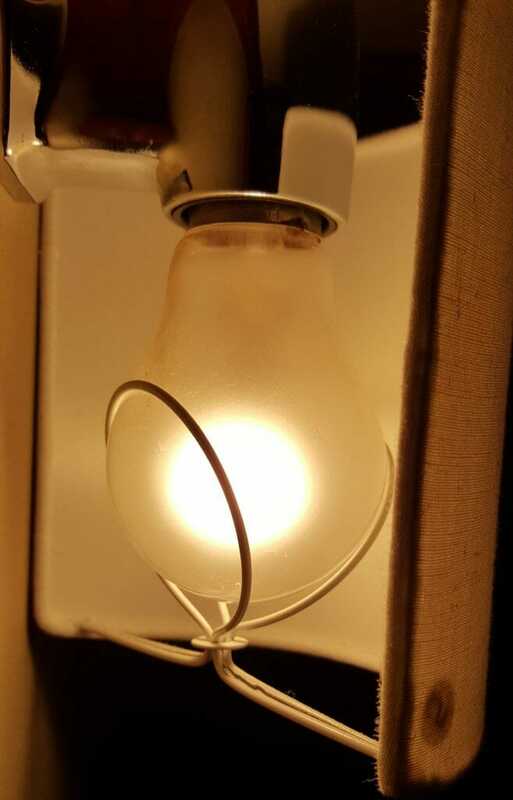 We have come such a long way since the days of using electricity to generate enough heat in a filament to reach incandescence, with only about 10% of the power expenditure producing light. Having all-LED lighting in the boat not only introduces interesting control and color options, but it significantly reduces the power required… in turn relaxing battery and charge system specs, reducing heat dumped into the cabin, and eliminating the need to carry a bunch of antique spares. The original masthead all-round white light from Nomadness. Ain’t she a beauty? This post ranged over some rather unrelated topics, but what they have in common is simple day-to-day lifestyle optimization. It is easy to overlook comfort when building a starship, and I’m very guilty of eliminating comfortable places to sit if it increases space available for blinky things. It is very much worth it to notice the little irritants of daily life, then take the time to fix them. The whole galley needs a post of its own, but I include this here to illustrate the two extremes in the range of boat projects. First, and most fun, there are the glamorous and exciting ones: ambitious, übergeeky, and highly inventive… the beautiful blinking creations that become a showpiece of the ship, pointed out on tours. 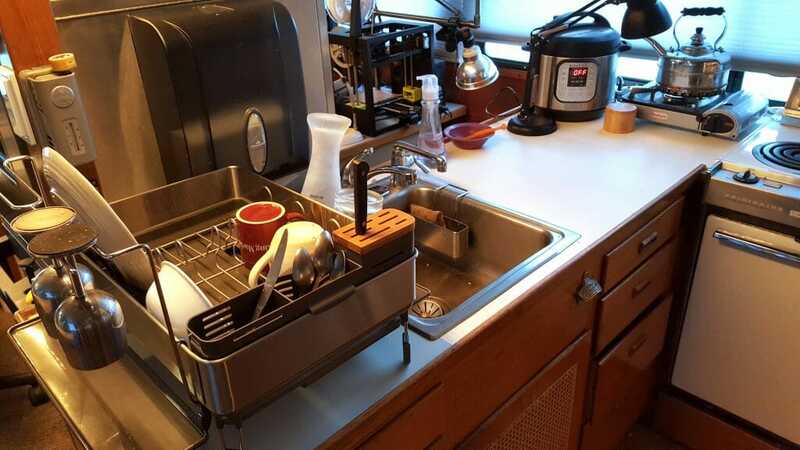 But behind the scenes and every bit as important are the ones that solve ongoing little irritants, like a shower caddy slipping down every day, trivially fixable with a hose clamp. Or missed visitors, fixed with a doorbell. Or fiddly dish drying, fixed with a decent rack. Whatever the case, in an immersive lifestyle project like this, it’s worth remembering to take care of the annoying stuff and pamper the bod. Without that, the epic gizmology is nowhere near as much fun! For another upgrade in this department, check out the boat bidet!